The famous snowstorm last week didn’t reach my town in New Brunswick. After 2 dry days around -29 Celsius (-20F) I did a 130 Km (80M) trip around 110km/hr (68MPH). That evening was -25 Celsius (-13F) with slight winds blowing fine snow over the highway. The slow lane was very clean due to the majority of traffic driving on it but the fast lane was kind of ice-dirty and with small chunks of snow on the left side. R2 SUV performance when passing large trucks was excellent. Despite the scary feeling and sight the SUV was pretty stable all the time. 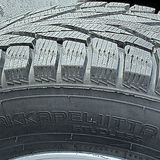 I passed once over cracked pavement bumping a bit and listening to a louder tire sound; Hakkapeliitta R2 SUV tires didn’t lose track at all.